Quinn doesn't like to speak in front of people, especially in class at school. So when I found out that every other month he would have to memorize and perform a poem in front of his reading class, I had one of those die-a-little-inside moments. I knew that Quinn often freezes then meltdowns if asked to do so much as read in front of the class, so I knew the fastest way to send him into a panic was to make him perform—with props and emotion—something he'd memorized. I contacted his teacher, asking for an accommodation. I suggested that he be able to do it just for her and not in front of the class. She came back with a suggestion that he do it at home and I videotape it. Boom. That is how you teach kids who learn differently. I was thrilled. Quinn was relieved, but still worried. He didn't think he could memorize a whole poem. We worked on two lines a night and by the end of the month, he (and the rest of the family) had his whole poem memorized. We taped it and he got the highest score possible. He was so damn proud. That was October. This month he had to do another one. All of the poems to choose from were either longer or more complicated than the one he'd picked for October. I was worried. Quinn ended up picking "The Lion" by Roald Dahl. I felt good about his choice because it's a funny little poem that I thought would make Quinn laugh. Unfortunately I didn't think about the fact that there is basically a complicated list within the poem that made it tough for him to keep things in the right order. 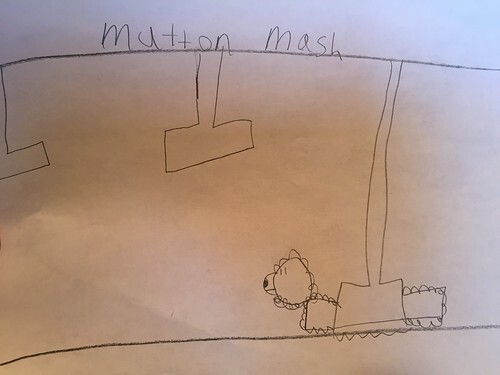 To help him, I suggested that he draw some pictures of the subject of that list so he could keep the order straight while he was trying to memorize. 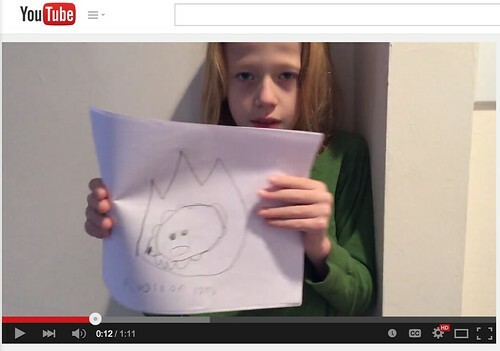 Then he could use the pictures as props when performing the poem for the camera. Quinn doesn't want me to post the video on the internet, but he told me I could post his pictures. So. 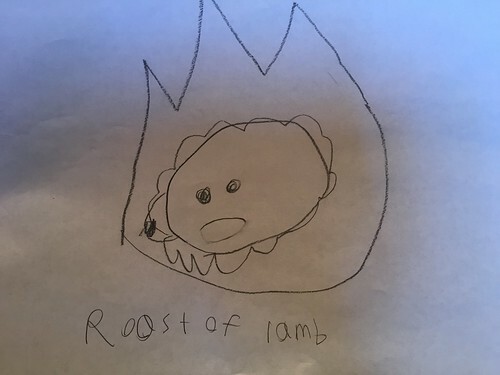 Without further ado, I present to you "The Lion" by Roald Dahl as illustrated by Quinn. This screen capture is the closest I can ethically come to posting Quinn’s video. Isn’t he cute? 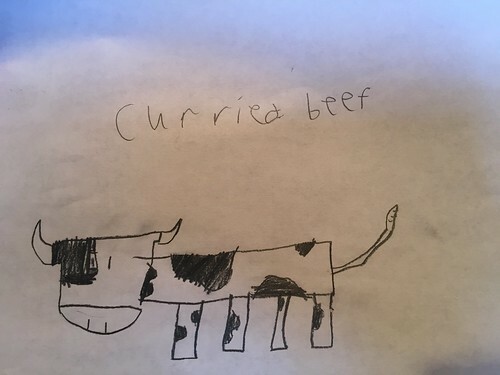 I didn’t really know how to advise Quinn to draw curried beef so he just drew a really cute cow. 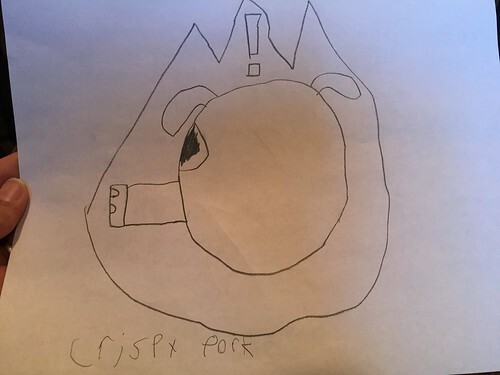 Don’t mess with Devil Pig. I think—THINK—that the pig is alarmed to be on fire. This is another one of those hard-to-draw ones. I think Quinn came up with an excellent idea of how to illustrate it. 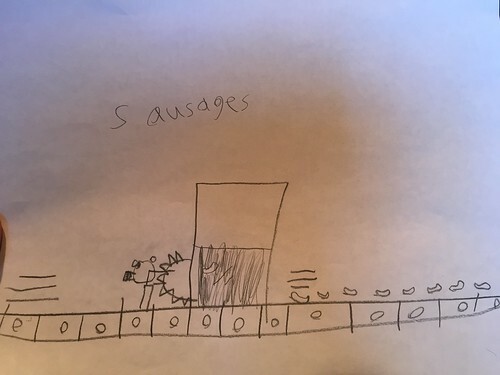 And that’s how sausages are made out of pigs. 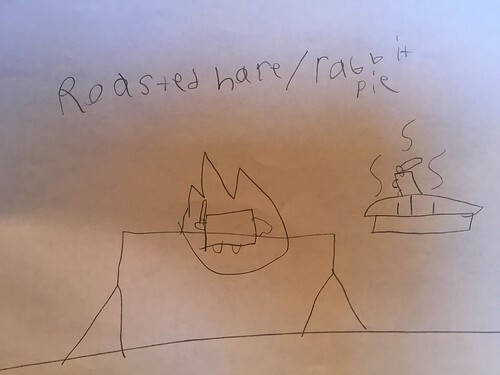 With rabbit pie or roasted hare? I think Quinn got tired of drawing here at the end. I even had to remind him to put long ears on his bunnies. I feel as if Mr. Dahl would be proud. I hope his teacher likes it as much as I do. Although it was hard to pick....my favourite was the mutton mash! :D Great job Quinn (and mom). 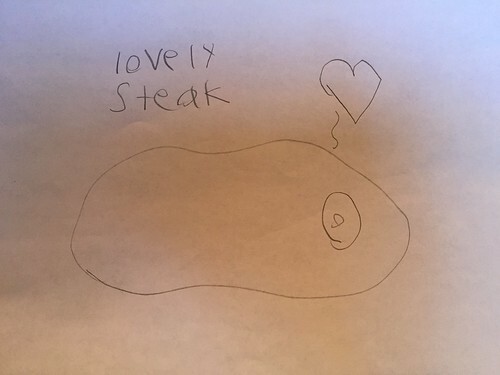 I especially love the cows. And how the pig is backing into the sausage machine. 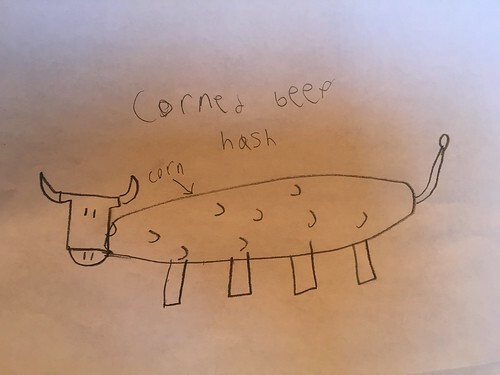 My favorite was corned beef hash. Clever Quinn!! I'd give him an "A"!!! Love Quinn's illustrations, AND that the teacher is able to adapt the learning activity to students' needs. OMG, the sausage one is cracking me up! That's fantastic. I have the same problem as Quinn with public speaking. I loved the illustrations maybe Quinn could be an illustrator for a children's book. 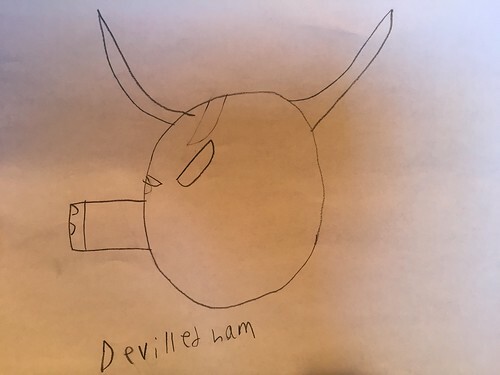 I love the deviled Ham!!! 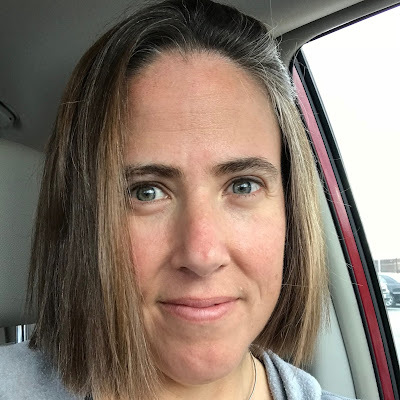 I have three sons with autism and my oldest one LOVES to videotape everything and make videos. Your sons teacher sounds amazing to work with you so well and be so considerate. Your blog is awesome! It seems I saw you on Autism Daddy as well as here. GO QUINN! You are awesome. 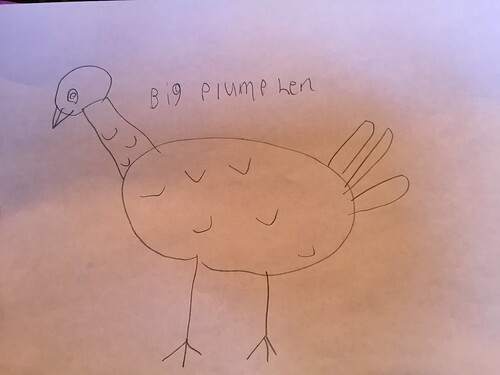 You also draw a lot better than I do.